No matter how much we love the new Windows 7 operating system, there will always be things that break from time to time. 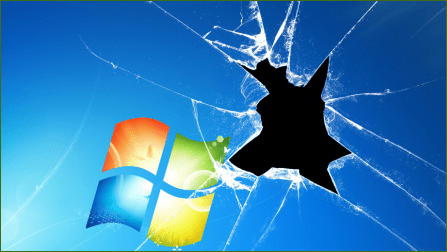 Using a free stand-alone application called FixWin, you might be able to solve many of these simple but common Windows 7 problems if you experience them. This tool also works on Windows Vista, but for this article, we’re going to focus only on Windows 7. Before you get started using any type of Windows tool from the Internet I always suggest you first make a System Backup, System Restore Point or better yet, take a fully system image. 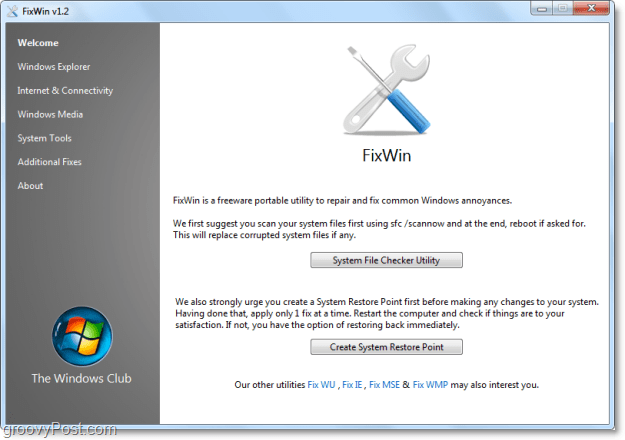 FixWin includes an automatic System File Checker which analyzes your Windows 7 system to ensure your issues are not the result of corrupted system files. It also verifies that none of your critical system files are missing (smart.) Once the checker utility finds an issue with a system file, it will automatically replace it with a fresh copy. Groovy! FixWin has a vast assortment of fixes. We’ll go down the list and take a look at just what FixWin can do. 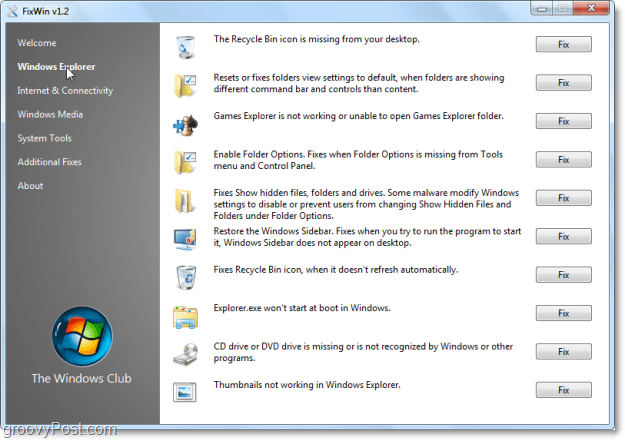 The Recycle Bin is missing from your desktop. Resets or fixes folders view setting to default, when folders are showing different command bar and controls than content. Games Explorer is not working or unable to open Games Explorer folder. Enable Folder Options, Fixes when Folder Options is missing from Tools menu and Control Panel. Fixes Show hidden files, folders, and drives. Some malware modifies Windows settings to disable or prevent users from changing Show Hidden Files and Folders under Folder Options. Fixes Recycle bin icon when it doesn’t refresh automatically. Explorer.exe won’t start at boot in Windows. CD drive or DVD drive is missing or is not recognized by Windows or other programs. Thumbnails are not working in Windows Explorer. Internet Explorer icon is missing from the desktop. It creates an Internet Explorer icon on your desktop. Complete or Skip the Run Once Wizard, when running Internet Explorer for the first time. Internet options are missing under Settings on the Advanced tab of the “Internet Options” dialog box. Optimize Internet Explorer’s maximum connections per server to download more than two files at once. Unable to change the home page, Internet Explorer launches every time with the MSN default home page. 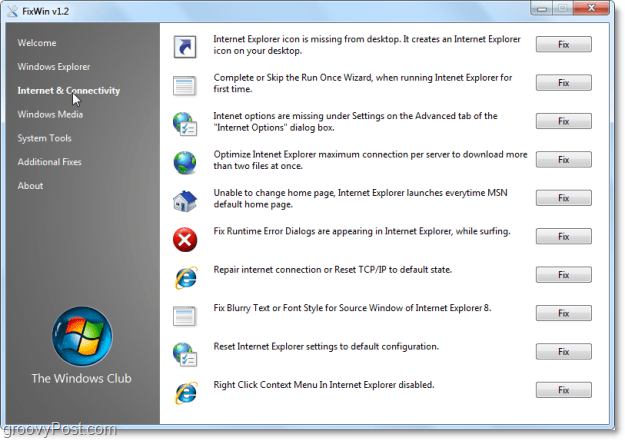 Fix Runtime Error Dialogs appearing in Internet Explorer while surfing. Repair Internet connection or Reset TCP/IP to its default state. Fix Blurry Text or Font Style for Source Window of Internet Explorer 8. Reset Internet Explorer settings for the default configuration. Right-Click Context Menu in Internet Explorer is disabled. Windows Media Player stops responding after you install a third-party product that registers its own version of the Wmp.dll file. Windows Media Player does not show slideshow correctly. Media files associated with Windows Media Player are missing the Right-Click Context Menu. Reset Windows Media Library and fix library sync issues. Automatic Updates not working for Windows Media Player. Flush and Rebuild Windows Media Center database. 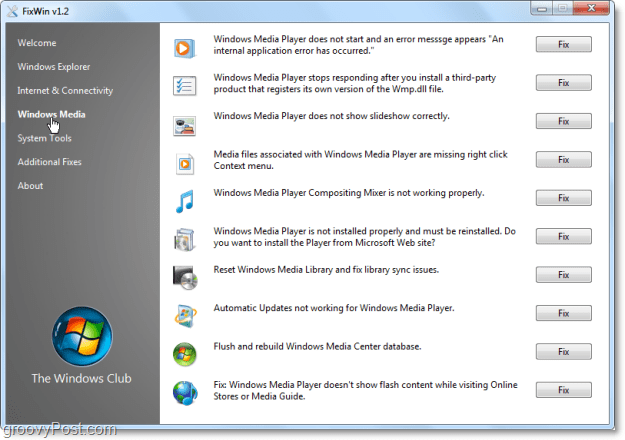 Fix Windows Media Player not showing flash content while visiting Online Stores or the Media Guide. Enable MMC Sap-ins. Some viruses prevent users from running MMC Snap-ins, such as Group Policy (gpedit.msc), Local Security Policy, Disk Management, etc. Device Manager is not working properly and is not showing any devices. Repair Windows Defender. A fix for all registry settings and services to set them to the Windows Defender defaults. 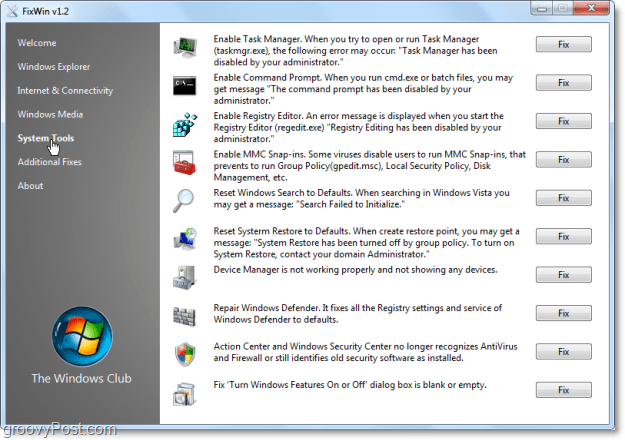 Action Center and Windows Security Center no longer recognize Anti-Virus and Firewall, or they still identify old security software as installed. Fix for “Turn Windows Features On or Off” dialog box being empty. Enable Hibernate and Hybrid Sleep feature. Fixes the Hibernate option missing from the Shutdown button. Restore the Windows Sidebar Gadgets. Sidebar Gadgets are missing from the Gadget panel. 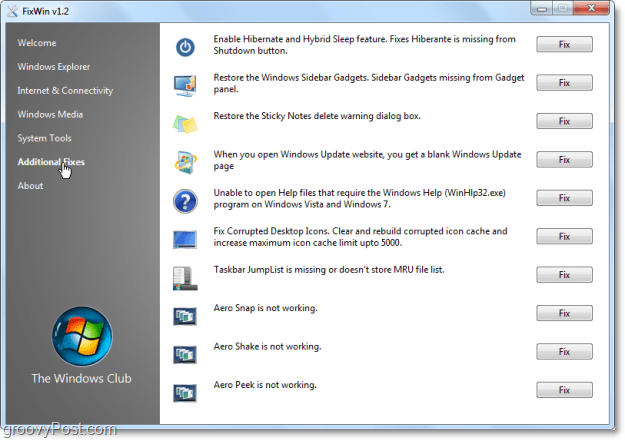 Restore the Sticky Notes, delete warning dialog box. Fix Windows Update website. When you open the Windows Update website, you get a blank Windows Update Page. Unable to open Help files that require the Windows Help (WinHlp32.exe) program on Windows Vista and Windows 7. Fix Corrupted Desktop Icons. Clear and rebuild a corrupted icon cache and increase the maximum icon cache limit up to 5000. Taskbar JumpList is missing or doesn’t store MRU file list. Aero Snap is not working. Aero Shake is not working. Aero Peek is not working. Once FixWin has found a problem it can solve for you, Click the Fix button, and FixWin will go to work. As soon as the problem is solved a small dialog window will display stating “The process completed successfully.” Simple is groovy! My favorite thing about FixWin (other than it’s freeware price) is that the application is stand-alone and doesn’t require any installation. As soon as you download the program, all you have to do is extract it from its .zip file and start it right up. Do you have a favorite Windows 7 Diagnostics/Repair Tool? Drop a comment below and let us know about it so we can feature it in our next groovyDownload Review! Nice, thanks for this. Good resource! this is a good review and it’s like a year old. ted. how do you ialtnsl … how do you ialtnsl the Security Update? mine want let me can you help? Do you know if they will be making tools like this for Windows 10? If so, are they available now or will that be a future endeavor?